The U.S. Navy is staging the aquatic-equivalent of a dog-and-pony show in the Arctic Ocean this month with a small fleet of nuclear-powered submarines. The military exercises are designed to bolster U.S. claims on emerging – and likely lucrative – commercial opportunities in the region, which have attracted intense interest in recent years as global warming accelerates what appears to be the permanent loss of sea ice in the Arctic. The National Snow and Ice Data Center reported in early March that 2011 has tied with 2006 for the record low sea-ice coverage in the Arctic Ocean (in the satellite record). By the mid-2030s, scientists have predicted that the Arctic will be ice-free for at least one month of every summer, which will expand to two-to-three ice-free months by around mid-century. The U.S. Navy has deployed two nuclear-powered submarines off the coast of Alaska close to a temporary camp constructed on the ice roughly 150 miles north of Prudhoe Bay. The submarines are conducting military training exercises. On March 7, 2011, the winter ice covering the Arctic reached its maximum size for the year at 5.65 million square miles, which is more than 20% below – or, 463,000 square miles – below the average annual coverage from 1979 to 2000 (6.12 million square miles). The orange line shows the 1979 to 2000 median extent for that day. The black cross indicates the geographic North Pole. The exercises train U.S. submarine crews to deal with craggy ice keels that extend 20 to 50 feet into the water, and varying salinity levels that complicate communications and navigation under the ice cap. A delegation of defense contractors and military brass visited the camp last week, according to Reuters. The training was meant to ensure that the United States maintained access to the Arctic, home to the world’s largest undiscovered oil and gas reserves. Russia, the United States, Denmark, Greenland, Canada and Norway, which border the Arctic, and China are also scrambling to control the region and access to the commercial ventures there. Jaehn is the commanding officer for the more than two dozen Navy officials, researchers, engineers and scientists working at the temporary ice camp. Ironically, finding a thick enough ice sheet to support the temporary camp was among the difficulties the Navy encountered this year. Receding ice levels are likely to open new shipping routes in the Arctic, which could ultimately make the Bering Strait between Russia and Alaska a compelling alternative to shipping lanes in the Persian Gulf and Indian Ocean. Mars is one seriously cold rock, so where better in the world to test a new spacesuit design then the permafrost of Antarctica? NASA researchers recently took the NDX-1 spacesuit prototype, designed at the University of North Dakota by Argentine aerospace engineer Pablo de Leon, for an Antarctic test drive where the suit was exposed to 47 mile per hour winds and frigid polar temperatures. The NDX-1 has been under development for several years now at UND’s Space Suit Laboratory, but this was its first test-drive in harsh, Mars-simulating conditions. The idea wasn’t just to take the suit somewhere cold, but also somewhere isolated “so that if something went wrong we couldn’t just go to the store,” De Leon said to Reuters. Not that you could patch the NDX-1 together at the local hardware store. The $100,000 suit (funded by NASA) contains more than 350 materials, including weight-reducing carbon fiber and Kevlar. A team of NASA scientists, including De Leon himself, took the suit through the paces of simulated spacewalks during which they collected samples and operated tools like drills–the very kinds of activities the first humans on Mars very well might undertake. If, that is, we ever get there. With NASA’s purse strings tightening, developing an interplanetary space vehicle may not be in cards for quite a while, leaving America’s astronauts all dressed up in their NDX-1s with no place to go. New isotope analysis and forensic facial reconstruction undertaken by a team led by English Heritage has shed new light on the doomed 1845 British voyage of Arctic exploration led by Sir John Franklin, in which all 129 people on board perished. Analysis of the only surviving complete skeleton has offered new clues as to why the expedition was lost, a mystery that has sparked debate ever since. Some have suggested that scurvy or tuberculosis may have been causes of debilitation and death on the expedition, but no evidence of these diseases was found on the bones, and DNA tests proved negative for tuberculosis. Work is still ongoing on samples from the remains to analyse for lead to see if lead poisoning from the expedition’s canned food or from their water supply was a factor. The study has also revealed that the identity of the skeleton is unlikely to be Henry LeVesconte, a Lieutenant aboard one of the ships, a conclusion that has been widely accepted since the skeleton was first examined in 1872 by Thomas Henry Huxley, one of the foremost biologists of the age. The remains thought to be Le Vesconte’s, and those of one other sailor, were the only ones ever to be returned to Britain. The lieutenant’s bones were buried beneath the Franklin Expedition monument at the old Royal Naval College in Greenwich. Renovations in 2009 of the memorial meant that the remains had to be exhumed and temporarily moved. This gave an opportunity for English Heritage to study the remains and to evaluate the twin questions of the identity of this particular skeleton and the reasons for loss of the expedition. Henry LeVesconte grew up in Devon. However, analysis of stable isotopes from the teeth of the skeleton shows that it is unlikely that this individual grew up there, but more likely that he spent his childhood in NE England or eastern Scotland. Moreover, 14 of the 24 officers on the expedition had their portraits taken by the newly devised Daguerreotype photographic process prior to embarkation. A forensic facial reconstruction was undertaken using the skull of the skeleton, and it seemed to match quite closely the appearance of Harry Goodsir, an assistant surgeon and naturalist on the voyage. Dr Simon Mays, skeletal biologist at English Heritage, said: ‘ The study of human remains and in turn our understanding of the past has benefited immensely from the advance of science and technology. The disappearance of Franklin’s heroic crew became a cause celebre in Victorian England, and the reasons for its loss continue to be debated. Our study offers some important clues to take the debate further. In May 1845, an expedition of two ships, commanded by Sir John Franklin and sponsored by the Royal Navy, set out from England to try and discover the Northwest Passage trade route to Asia. The expedition’s disappearance caused a sensation in Britain, prompting huge rescue efforts that helped map much of the vast and remote polar archipelago of the Canadian Arctic. The study was undertaken at the request of the Greenwich Foundation for the Old Royal Naval College and with the consent of a LeVesconte relative at English Heritage’s laboratories in Portsmouth and at the Universities of Bradford and Surrey between 2009 and 2011. The remains have been reburied under the memorial. There are those predicting doom and gloom for electric cars when temperatures drop, and those steadfastedly saying that frigid batteries will not be the end of the road when it comes to fuel-free transportation. The reality lies somewhere in between, but Volvo’s at least doing the right thing: testing the frozen snot out of its C30 Electric way up north of the Arctic Circle. When things get really cold the car can use an ethanol-powered heater to keep things comfortable for both drivers and batteries and, at temperatures down to -30C (that’s -22F), the car has proven to manage a range of 80km, which is just a tick under 50 miles. Given the hatchback is rated for 100 miles of range when warmer that’s not exactly good news for Eskimo environmentalists who love Swedish cars. Still, it also must be said those are rather extreme conditions, as shown in the video below, which also includes footage of some extreme elk reindeer herding. Bad news for what is now the beginning of the “melt season” in the Arctic. Right now, the sea ice extent maximum appears to be tied for the lowest ever measured by satellites as the spring begins, according to scientists at the University of Colorado Boulder’s National Snow and Ice Data Center. And because of the trend of how the amount of Arctic sea ice has been spiraling downward in the last decade, some scientists are predicting the Arctic Ocean may be ice free in the summers within the next several decades. “I’m not surprised by the new data because we’ve seen a downward trend in winter sea ice extent for some time now,” said Walt Meier, a research scienitist with the NSIDC. The seven lowest maximum Arctic sea ice extents measured by satellites all have occurred in the last seven years, and the from the latest data, the NSIDC research team believes the lowest annual maximum ice extent of 5,650,000 square miles occurred on March 7 of this year. The maximum ice extent was 463,000 square miles below the 1979-2000 average, an area slightly larger than the states of Texas and California combined. The 2011 measurements were tied with those from 2006 as the lowest maximum sea ice extents measured since satellite record keeping began in 1979. Virtually all climate scientists believe shrinking Arctic sea ice is tied to warming temperatures in the region caused by an increase in human-produced greenhouse gases being pumped into Earth’s atmosphere. Meier said the Arctic sea ice functions like an air conditioner for the global climate system by naturally cooling air and water masses, playing a key role in ocean circulation and reflecting solar radiation back into space. In the Arctic summer months, sunlight is absorbed by the growing amounts of open water, raising surface temperatures and causing more ice to melt. Since satellite record keeping began in 1979, the maximum Arctic sea ice extent has occurred as early as Feb. 18 and as late as March 31, with an average date of March 6. Since the researchers determine the maximum sea ice extent using a five-day running average, there is small chance the data could change. As of March 22, ice extent declined for five straight days. 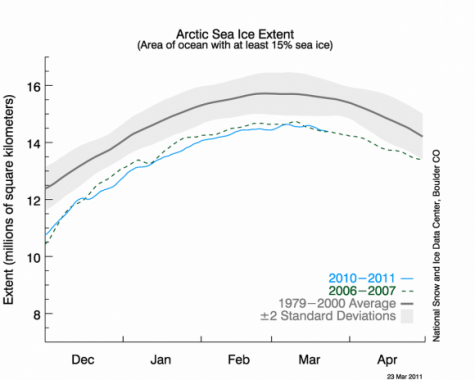 But February and March tend to be quite variable, so there is still a chance that the ice extent could expand again. Ice near the edge is thin and is highly sensitive to weather, scientists say, moving or melting quickly in response to changing winds and temperatures, and it often oscillates near the maximum extent for several days or weeks, as it has done this year. In early April the NSIDC will issue a formal announcement on the 2011 maximum sea ice extent with a full analysis of the winter ice growth season, including graphics comparing 2011 to the long-term record. Pentagon Comptroller Robert Hale, Navy Secretary Ray Mabus and a Who's Who of other VIPs braved below-zero temperatures this month to visit a temporary camp on the ice about 150 miles north of Prudhoe Bay, Alaska, where two nuclear-powered U.S. submarines are conducting military training exercises. A congressional delegation and the Secretary of the Navy walk around the Seawolf class submarine USS Connecticut after the boat surfaced through through Arctic sea ice during an exercise near the 2011 Applied Physics Laboratory Ice Station north of Prudhoe Bay, Alaska March 18, 2011. The new digital “Deep Siren” tactical messaging system built by Raytheon Co could revolutionize how military commanders stay in touch with submarines all over the world, allowing them to alert a submarine about an enemy ship on the surface or a new mission, without it needing to surface to periscope level, or 60 feet, where it could be detected by potential enemies. At present, submarines use an underwater phone to communicate with associates on top of the ice or with other submarines, but those devices are little more than tin cans on a string and work only at shorter distances. Picture taken March 18, 2011. Pentagon Comptroller Robert Hale, Navy Secretary Ray Mabus and a Who’s Who of other VIPs braved below-zero temperatures this month to visit a temporary camp on the ice about 150 miles north of Prudhoe Bay, Alaska, where two nuclear-powered U.S. submarines are conducting military training exercises. He said U.S. submarines are a powerful symbol of U.S. military power, and the training was meant to ensure that the United States maintained access to the Arctic, home to the world’s largest undiscovered oil and gas reserves. “It is a key potential transit line between the Atlantic and the Pacific. We want to be able to demonstrate that we have global reach. That we can operate in all oceans, and that we can operate proficiently in any environment,” Jaehn said. Russia, the United States, Denmark, Greenland, Canada and Norway, which border the Arctic, and China are already jockeying for position to benefit from new business opportunities there. Navy scientists predict the Arctic will have one ice-free summer month in about the mid-2030s, and two to three ice-free months by around mid-century. Less ice means the 56-mile wide Bering Strait between Russia and Alaska could one day compete with the Persian Gulf and other shipping lanes because it is as much as 40 percent shorter than conventional routes. Changing ice conditions in the Arctic are expected to lead to greater commercial traffic, increasing the need for submarine and Coast Guard patrols. The Navy’s chief oceanographer, Rear Admiral David Titley, who visited the camp last week, said just finding a thick enough multi-year ice sheet to put the camp was difficult this year. The freshwater content of the upper Arctic Ocean has increased by about 20 percent since the 1990s. This corresponds to a rise of approx. 8,400 cubic kilometres and has the same magnitude as the volume of freshwater annually exported on average from this marine region in liquid or frozen form. This result is published by researchers of the Alfred Wegener Institute in the journal Deep-Sea Research. The freshwater content in the layer of the Arctic Ocean near the surface controls whether heat from the ocean is emitted into the atmosphere or to ice. In addition, it has an impact on global ocean circulation. Around ten percent of the global mainland runoff flows into the Arctic via the enormous Siberian and North American rivers in addition to relatively low-salt water from the Pacific. This freshwater lies as a light layer on top of the deeper salty and warm ocean layers and thus extensively cuts off heat flow to the ice and atmosphere. Changes in this layer are therefore major control parameters for the sensitive heat balance of the Arctic. We can expect that the additional amount of freshwater in the near-surface layer of the Arctic Ocean will flow out into the North Atlantic in the coming years. The amount of freshwater flowing out of the Arctic influences the formation of deep water in the Greenland Sea and Labrador Sea and thus has impacts on global ocean circulation. Dr. Benjamin Rabe from the Alfred Wegener Institute for Polar and Marine Research in the Helmholtz Association and his colleagues have evaluated a total of over 5,000 measured salt concentration profiles. To measure the depth distribution of the salt concentration, researchers used sensors from ships or mounted sensors on large ice floes so the data were recorded during the ice drift through the Arctic Ocean. Furthermore, measured values from submarines were inputted in the analyses. Major portions of the data stem from expeditions during International Polar Year 2007/2008. “The well coordinated research programmes in the Arctic have substantially improved the database in these difficult to access areas,” reports Rabe, who will again sail to the central Arctic on the research vessel Polarstern in the coming summer. The dense network of observations in recent years made it possible for the first time to come up with a comparative assessment of the freshwater content in the Arctic Ocean. Rabe and his colleagues have published the increase in the freshwater content between the periods 1992 to 1999 and 2006 to 2008 in the journal Deep-Sea Research. “The considerable changes in the upper water layers primarily comprise a decline in salt concentration,” says Rabe. Another, though minor, effect is that the low-salt layers are thicker than before. The freshwater content of the Arctic Ocean may rise due to increased sea ice or glacier melt, precipitation or river inputs. Less export of freshwater from the Arctic – in the form of sea ice or in liquid form – also results in a rise in the freshwater content. The authors of the study point to altered export of freshwater and altered inputs from near-coastal areas in Siberia to the central Arctic Ocean as the most probable reasons. Dr. Michael Karcher from the Alfred Wegener Institute, co-author of the study, simulated the observed processes using the NAOSIM coupled ocean/sea ice model. The model experiments make it possible to study longer periods, i.e. to map times for which no measurement data are available. The model also supplies important insights into the causes of the rising and falling freshwater content and points out the great significance of the local wind field. Measurements and the model additionally show that the changes in the Arctic freshwater content encompass far larger areas than assumed to date. The title of the original publication by Benjamin Rabe, Michael Karcher, Ursula Schauer, John M. Toole, Richard A. Krishfield, Sergey Pisarev, Frank Kauker, Rüdiger Gerdes and Takashi Kikuchi is: “An assessment of Arctic Ocean freshwater content changes from the 1990s to the 2006-2008 period“ and appeared in the journal Deep-Sea Research I 58 (2011) 173-185; doi:10.1016/j.dsr.2010.12.002 (http://dx.doi.org/10.1016/j.dsr.2010.12.002). The Alfred Wegener Institute conducts research in the Arctic, Antarctic and oceans of the high and mid latitudes. It coordinates polar research in Germany and provides major infrastructure to the international scientific community, such as the research icebreaker Polarstern and stations in the Arctic and Antarctica. The Alfred Wegener Institute is one of the seventeen research centres of the Helmholtz Association, the largest scientific organisation in Germany. The Kremlin wall is reflected in a plaque at the entrance of the headquarters of the state-owned oil company Rosneft in Moscow. Russia's largest oil firm Rosneft threatened to seek compensation from the British energy giant BP over a blocked deal to jointly dig for oil in the Arctic. Russia’s largest oil firm Rosneft threatened on Friday to seek compensation from the British energy giant BP over a blocked deal to jointly dig for oil in the Arctic. Deputy Prime Minister Igor Sechin — chairman of the Rosneft board and a close ally of Vladimir Putin — said Rosneft would not be deterred from its plans to explore the untapped northern sea riches whoever its partner might be. Sechin’s comments suggested that Rosneft was willing to move on if its $16 billion tie-up with BP failed to go though because of the Stockholm arbitration panel ruling. The Stockholm panel said the deal violated BP executive’s shareholder agreement with the Russian partners in their local TNK-BP joint venture. TNK-BP had a right of first refusal on all BP deals in Russia and wanted to take its parent company’s place in the Rosneft alliance. The Russian energy czar had previously warned that Rosneft would seek compensation from either BP or TNK-BP if their internal boardroom struggle ultimately scuppered the deal. And he repeated on Friday that Rosneft planned to “respond in an adequate manner” to the Stockholm panel decision. “Why only BP?” Sechin told Russian news agencies when asked if Rosneft might now seek damages from the British firm. “The company will weigh who is at fault for the break-up. There are certain losses there (at Rosneft) already,” he added. Analysts said the billionaires who represent the Russian half of TNK-BP may now either seek tens of billions of dollars as a buyout from BP or otherwise leverage their position as a vital player in the politically-sensitive tie-up. The unprecedented Rosneft-BP share-swap and Arctic exploration agreement was announced with great fanfare by Putin on January 15. The deal would have handed Rosneft five percent of BP’s ordinary voting shares in exchange for approximately 9.5 percent of the Russian company’s stock. The two firms also agreed to jointly search for oil in Rosneft’s three licensed blocks in the Arctic — a 125,000 square kilometre (48,000 square mile) region said to contain five billion tonnes of oil and 3.0 trillion cubic metres of gas. BP said in a statement that it may now return to arbitration in a bid to complete the share swap portion of the Rosneft agreement. Sechin said he was willing to wait for BP executives and their Russian partner to come to some sort of agreement before deciding how to proceeded. But he stressed that the setback would not alter Rosneft’s plans to explore the Arctic no matter whom its partner might be. “Arctic exploration will continue in any event,” Sechin was quoted as saying by Russian news agencies. “BP suits us as a partner, but the current complications should in no way affect our overall plans on Arctic exploration,” he said. News of the decision sent Rosneft shares down one percent in later afternoon trading on Moscow’s MICEX exchange while those of TNK-BP were up two percent. APPLIED PHYSICS LABORATORY ICE STATION, Arctic Ocean — The United States is staging high-profile submarine exercises in the Arctic Ocean as evidence mounts that global warming will lead to more mining, oil production, shipping and fishing in the world’s last frontier. “It is important for us to continue to train and operate in the Arctic,” said U.S. Navy Captain Rhett Jaehn, the No. 2 official overseeing U.S. submarine forces. The Navy’s chief oceanographer, Rear Adm. David Titley, who visited the camp last week, said just finding a thick enough multi-year ice sheet to put the camp was difficult this year. Jaehn is the officer in charge of the temporary ice camp, where more than two dozen Navy officials, researchers, engineers and scientists, and some military officials from Britain and Canada, are facilitating the biannual exercises.